This is my first ICC post and what a wonderful dish!!!!!! First I as nervous about getting the right consistency but then the recipe instructions was so neat and to the point that I did not have any problem. I am so happy that the dish turned out fine in my very first attempt and it has become one of our family's favourite. Cute khandvis. 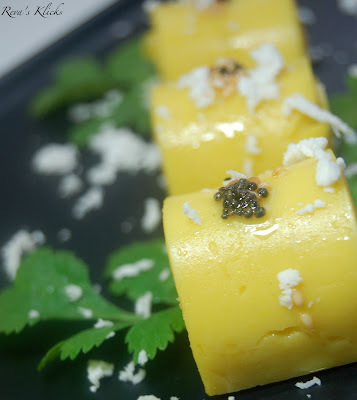 Very beautiful snaps..
Khandvi looks absolutely prefect Reva, welcome to ICC:)..
Beautiful pictures..glad you joined us..